Not that long in terms of a lifetime. Not that long in terms of adulthood. Not that long in terms of waiting for NFL training camps to open! Six months does equal a lot of TIME . . . 181 days equals 4, 344 hours . . . 181 days equals 260,640 minutes. . .181 days equals 15,638,400 seconds, BUT 181 days also equals 181 DIFFERENT bottles of wine – tasted, reviewed and shared! AND, the best is yet to come! Yep, we’re now on the downhill side of BJWine365 – and we’re on a roll to try, taste and blog about a different wine every night. . .we’re heading strong for August 31st and it’s going to be here before we know it! In the past six months, we started right out of the box with a set of amazing wines from Twin Liquors‘ 75th Anniversary Sale. That sale gave us an affordable foundation for the first 45-60 days of this blog. By visiting and talking with Patrick from Grape Juice and Peter from The Main in Kerrville; Nathan from Gabriel’s in San Marcos; Andy from Central Market in Austin and several others, we’ve amassed a wide variety of wines, varieties, flavors and countries in our first six months. Our challenge is still ahead and our resolve is strong . . . no duplicate wine in the next six months. . .only new wines–some from the same vineyards (hey, it helps spread the word! )–some from brand new sources and some from–well, places we’ve never been to before! A roller coaster you ask? You bet–but, if the next six months are as fun as the first six months, you’ll be reading about this blog for years to come! Each day, more and more of you are kind enough to pass along our blog or a link or a Facebook post, and that helps us garner more views and attention. We’ve been fortunate enough to hear from some of the wine makers who make the wine that we’ve written about, and our hope is to engage even more as time goes on. Tonight, we went to the land down under . 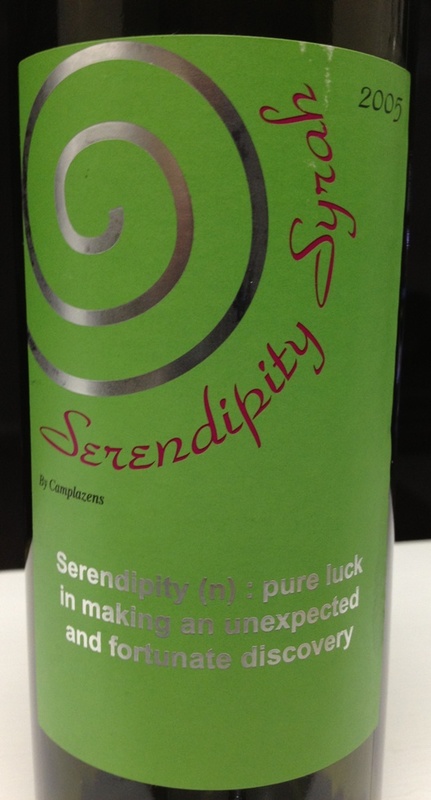 . . being BIG fans of Australian wines, we came across this one at Twin Liquor‘s Dollar Sale. 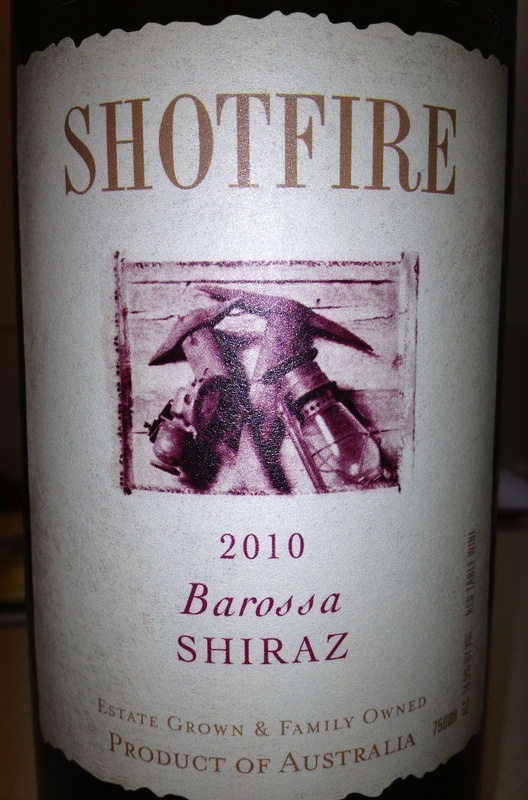 Since we’ve had good success with wines from the Barossa Valley – they tend to be big and bold – we thought that the 2010 Shotfire Shiraz would be a good way to wrap up the first six months of our blog. Their comments, “Deep red color, with a lifted and intense nose of blackberry fruit, sweet spice and dark chocolate. The palate is very rich and flavorsome with blackberry and plum fruit.” Our comments, Yes, the color ws superb–rich, dark red–and the nose was fruity but had a subtle hint of smokiness. The taste was rich, full of fruit, a slightness of chocolate, but the finish – well, it just didn’t quite measure up to the rest of the wine. No, it’s a very tasty wine, but don’t expect a “marching band” on the finish. It’s big, but not so big that you melt into your chair as your sipping on this wine. We have enjoyed numerous wines from Australia, and we’ve been pretty upfront about our love for the big, bold, in-your-face wines of not only the Barossa Valley but also McLaren Vale. Since this wine was on sale for less than $15 at Twin, in spite of its’ finish, this one was a winner. We’d buy it again, but the sale price is about the value we’d place on it. . .much more than that and it has competitors that are better. Since it’s a 2010, it’s also younger than some of its’ 2009 cousins, so look, taste and decide! We hope that you’ll stay with us for the next six months. We’ve searched the blogosphere as well as the wine internet and haven’t found a wine-lover site that has reviewed 365 different wines in 365 days. The BIG question is, how are we going to find the next six months worth of wine? Well, we guess you’ll have to keep reading–and hopefully commenting–to see what wines we find to settle our fancy. Until then, remember to enjoy your favorite wine responsibly and recycle whenever possible. Categories: Uncategorized | Tags: australia, Barossa Valley, CEntral Market, Grape Juice, Shiraz, shotfire shriaz, The Main, Twin Liquors | Permalink. Day 180: Where Angels Goes, Trouble Follows . . .
We knew we were in trouble. It started with an email that Jean received on Monday. She forwarded it to Brian at work and to the house. Oh, this wasn’t going to be good . . . not at all! It intensified Monday night. Yep, we had just turned on the television to catch the late, local news, and there was the second sound (aka our good friend Sandra) of trouble. It got worse on Tuesday morning; when the alarm went off and the third sign that we were in trouble played on the radio. The message was repeated on the television — not once but twice — we were doomed. To make matters worse, it was happening over THREE days. They already knew that they had us. All we could do is raise a white flag, throw in the towel, walk away from the ring, hang up our cleats . . . and give in. It was like – we could hear the theme song from the movie, “Jaws” playing in the background and getting louder and louder (“think you’re gonna need a bigger boat”) . . . What are we talking about? Uh yeah! The folks at Twin Liquors really know how to sucker punch a couple of wine lovers! Oh, no . . . it’s not good enough to just have a 75th Anniversary Sale last August . . . NOOOOO! 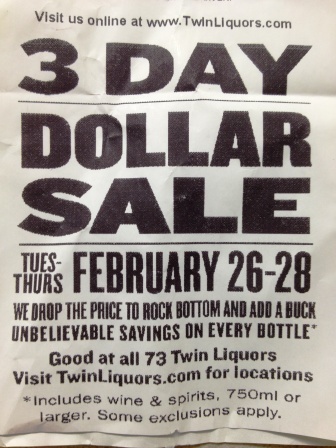 They had to go out and create a ‘Dollar Sale’ for three days in February. So, they mark down their product to the lowest price; add a dollar for margin and sell it. For wine lovers, it’s the difference between three bottles and eight bottles. For amateur wine bloggers, it’s like a gift from above! 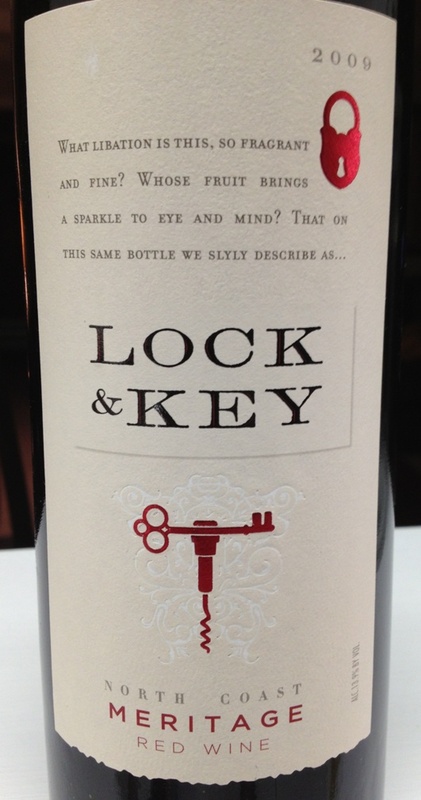 We can “unlock” some great values in different wines, and the “key” is to save some cash! So, tonight, we “invested” at Twin Liquor in San Marcos and found this 2009 Meritage from St. Helena, California in the heart of Napa County. Most places have it priced between $13 – $16 a bottle, but tonight we made off with it for less than $11. In terms of pricing, score a big one for the bloggers. When we opened it up, the cork was fresh, moist and the smell was fruity with hints of oak. This wine, we learned, is from the Trinchero Family of wines . . . which means, it comes from a BIG operation! This wine is a true Meritage blend of 60% Cabernet Sauvignon, 37% Merlot and 3% Cabernet Franc and the grapes are sourced from some of the best vineyards in Sonoma and Lake counties. To be honest, at first we weren’t too sure about this bottle . . . The nose was heavy with prunes or dates – not sure which ones because it was overpowering. The color was oh so close to copper but still held a dark burgundy tone. The taste upon initial opening wasn’t good at all. It was more like ‘pucker time’ than wine time! However, like most wines with a good heritage, the key to unlock the flavor of this wine was time . . . the longer the bottle stayed open, the better the wine began to taste. Even as we type tonight’s blog and sip on the wine, it’s changing . . . the flavors are now deepening and becoming much more pronounced. A richer, deeper flavor that seems to be much more advanced than the wine that we smelled and tasted upon opening. Again, it was soft and supple with a pleasant combination of black cherry cola, dark spices, sandalwood and tannins making it a tremendous value at this price point. In other words, the wine works – – even though it was slow to open, the wine is extremely enjoyable and delicious and for the price point under $11 a bottle, we could be convinced to buy a few more of these and save them for “later”. For the record, there is a golden oldie movie classic with the same name as tonight’s blog. Name two of the actresses who starred in the movie and have gone onto much higher levels of fame. A bottle of tonight’s wine goes to the first one who chimes in with the correct answer . . . pretty sure there are a few Freitag’s out there who can “name that tune” . . . Regardless of whether you lock your wine or open it with a key, please remember to enjoy your favorite wine responsibly and recycle whenever possible! Categories: Uncategorized | Tags: Angles Follow movie, cabernet franc, cabernet Sauvignon, Hailey Mills, Lock & Key Meritage, Meritage, merlot, sonoma, Twin Liquors, Where Trouble Goes | Permalink. Day 178: Boy, Did We Miss Something . . .
Yeah, so we maybe were asleep at the wheel because we were supposed to blog about a Mardi Gras wine on Fat Tuesday, but, well, we flat out missed this opportunity. Oh, yes, of course we blogged about a wine that night but not THE wine that was supposed to be written about . . .seriously, how could we mess up this bad? We had a wine from our days in Kerrville when we enjoyed attending Mardi Gras On Main . . . even though it wasn’t really on Main . . . but the Mardi Gras theme was alive and well. The crowds were huge; the food was terrific and the wine was red or white! The premise? Each year a different Texas winery was “commissioned” to provide the Mardi Gras on Main wine complete with vintage and label. We’ve got wine Texas wine that goes back to 2007, and hopefully, it will still be drinkable in 2013 or 2014. But the wine that we intended to write about – two weeks ago – was sitting in our rack until the realization hit us tonight . . . DUH! Bart, we missed it!!! (A nod to The Simpsons). Well, being diligent wine lovers, we felt (feel?) obligated to at least open up the wine and taste it for blogging purposes only. So, tonight. . .even though it’s not available for purchase . . . here are our comments on the Kerrville Mardi Gras on Main 2010 Roulet Rouge wine . . . vinted and bottled by Messina Hof Winery of Fredericksburg and Bryan, Texas. The wine was . . . well, young. Or maybe it was a little sweeter than we prefer. Regardless, this wine tasted completely different tonight than what we remembered at the event. Yes, the wine has aged in the bottle since then and yes, tastes change as well over the years, but sweet wines really aren’t our forte. And, had we really thought that the wine would be sweet as opposed to dry or even semi-dry, we’d probably have nicer things to say about it. In reality, when you come home from work and heat up some spicy kung pao chicken, we’re thinking a big Zin-type wine with lots of pepper and not a sweet, syrupy wine like we tasted. And, in all fairness, we caught it on the nose . . . not much, if any, oak . . . we definitely smelled fruit, but it was fruit sprinkled with sugar–which as you know makes a syrup. It could be that we waited too long to try this wine. We did that with some wine we bought on a trip to New Mexico. That wine tasted really well at the vineyard, but when we opened it up, the copper color was a dead giveaway to the taste . . . AWFUL! While this wine wasn’t copper colored, it was lighter than most big reds that we’ve tried and once we had the first taste, we knew that it wasn’t a wine that we’d finish off. So, hopefully . . . you had a great time at your Mardi Gras party. 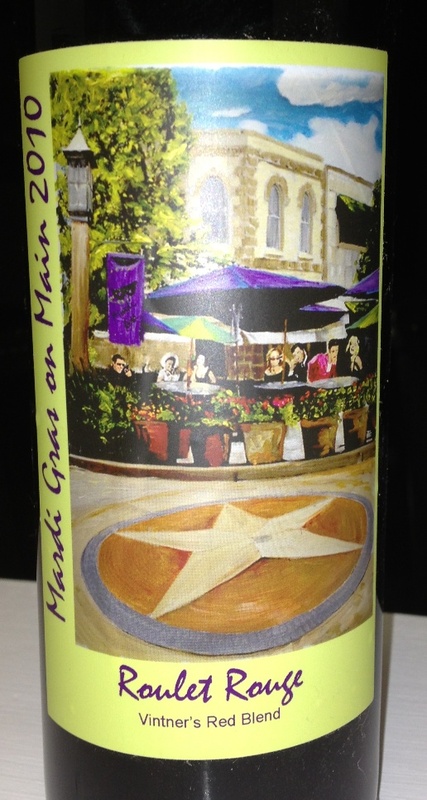 We understand that the Mardi Gras on Main is still going strong in Kerrville and they have a new vintage for 2013. That’s very cool, but knowing now what we know . . . we should have partied with the wine from the event sooner; who knows, we may have even liked it. Here’s to your Monday and a Terrific Tuesday. Remember to enjoy your favorite wine responsibly and recycle whenever possible. Categories: Uncategorized | Tags: Mardi Gras on Main, Messina Hof | Permalink. Day 177: And the Award Doesn’t Go To. . .
As we sit and watch the Oscar’s tonight, we’ve be watching to see if ‘bias creep’ comes back; since ARGO is a film largely based on the entertainment industry’s ability to help a historical situation or will Spielberg dominate once again with his amazing bio-pic of ‘Lincoln‘? Duh . . . of course, Hollywood ALWAYS sides with HOLLYWOOD!!! Congrats to Director Ben Affleck (we REALLY liked ARGO), but please don’t confuse him with “Best Director”, Ang Lee . . . HUH? Seriously? What do those folks smoke, drink or consume? How – how do you give a best directing for a film that had virtually NO live action? It was almost ALL special effects? Directing? And Spielberg never got an Academy Award for Star Wars because it was almost ALL special effects . . . What’s up with that??? Sorry we get off of our soap box to talk about wine . . .and the good news or the bad news depending on your viewpoint is that the 2oo5 Serendipity Syrah is LOUSY! No, we’re being nice. It’s rough . . . like, “how am I going to finish this glass”, rough! We’re not sure why it’s priced (before being on sale) at almost $12 bottle. Not much to report here . . . way too much green pepper and ‘unharvested’ fruit. The nose was harsh and the taste was even more harsh . . . it’s like, why even bother to bottle this stuff. Ordinarily, we could come away with something positive about a wine in this situation, but when we have to call it names and pour it down the drain – – we are dealing with a dog . . . a loser . . . and an award “recipient” that won’t be around at the end of the telecast – in other words, “a box office flop”. There are so many EXCELLENT wines to choose from on the “menu” of local wine and liquor stores. It’s amazing to us to see the lack of quality in locally produced and other areas-produced wines. Even though this wine was a 2005 Syrah, it didn’t fill the bill in terms of smell, taste, finish or any other wine loving categories. It didn’t do anything but just SIT there. We hope that you’ll enjoy your favorite wine responsibly, and remember to recycle whenever possible. Categories: Uncategorized | Tags: Best Picture award, Hollywood, movies, popcorn, Serendipity Syrah, The Oscars, the Red Carpet | Permalink. Day 176: Not Much Success on the Hill . . .
What a beautiful day in our part of the world. Lots of bright sun and a warming breeze all combined for several hours of relaxation on the deck this afternoon. The great news? Daughter #1 arrived safely from East Texas complete with the “granddog” in tow. Yep, our Miss Bridget, fresh from that ‘life altering’ surgery seemed no worse for the wear as she was reunited with our trio of “wastes of fur”! It’s kind of funny to watch dogs reacquaint themselves with each other . . . sniffing, growling, barking and LOTS of running around. Fortunately the deck is large enough that they can run around – be dogs – and not have to worry about chasing them all over the place! It’s a long drive from East Texas to our part of the State, so we knew that she was going to be: A) Tired, B) Hungry, C) Talkative or D) All of the Above. . .if you answered D) All of the Above, you’d be correct! But, it’s ALWAYS a treat to have one of both daughters home. . .it’s one of life’s moments that reminds us why we had kids in the first place and what our job as parents really is. . .to raise confident, contributing members of society that have an education, a purpose and a desire to do more. Not sure if we’re there yet, but like any of us, it’s a work in progress. The fact is that Daughter #1 graduates from college in roughly three months, and the reality of her situation is–she’s done it in FOUR years! Back in the ‘dark ages’ when we went to college, graduating in four years was the norm. . .but apparently, today–it’s some kind of a badge of honor to go BACK to school for four and a half, five, six–even seven years—to earn a Bachelor’s degree! In our eyes, the four year college student has gone the way of the pay phone. DINOSAUR! It’s kind of like watching our federal government–they’re supposed to spend ONLY what they take in, and that’s the way things had been done for some years in the not so distant past, but now–it’s like a badge of honor to spend WAY more than your taking in and then somehow, it’s the fault of those raising the revenue because they haven’t raised enough? HUH? What kind of twisted, demented economics logic is that? Oh, wait–it’s the government and they’re here to help! YEAH, RIGHT! 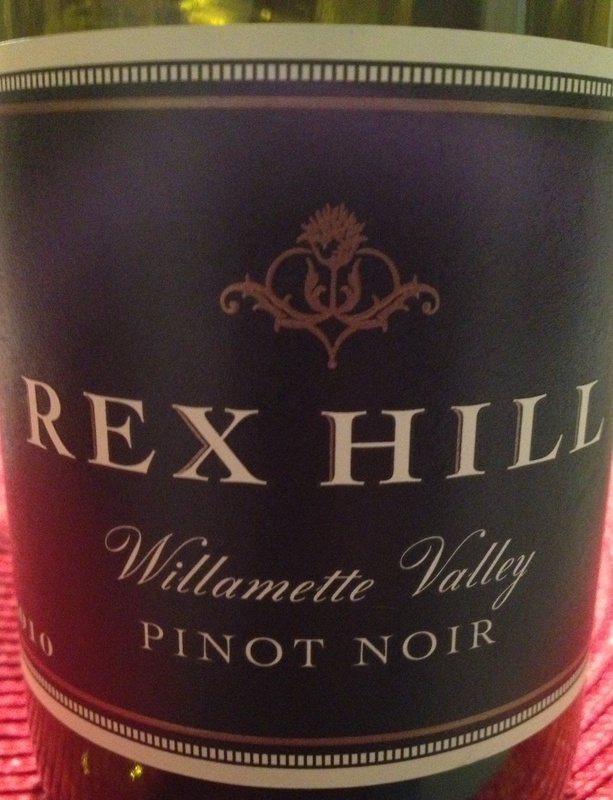 So today we stopped at Gabriel’s and grabbed a bottle of Oregon Pinot Noir. . .a 2010 Rex Hill Pinot Noir from Willamette Valley. The price point on this wine is above our normal range. . .at roughly $25 a bottle. We took the wine to our resident-family affecionado of good Pinot Noir wines, Jean’s Dad aka Bill’s place so that Papa and granddaughter could visit. And, after opening the bottle and smelling the wine upon uncorking, we were less than impressed. Hidden among the sweet cherry scent was an underwhelming musty aroma to this wine. Additional air time didn’t seem to help it lose the mustiness. Getting past the nose, the taste was fruity indeed, clearly, this was a sweeter Pinot than we were used to and with a meal of grilled steak, baked potatoes and sauteed vegetables, the wine just didn’t measure up. For the money–it was a waist (sic)–kind of like some of the spending in Washington (D.C.). As we learned about the wine, we decided that whomever wrote the tasting notes, must have been a little under the weather that day as very little, if any of what they wrote was present. For example, they noted, “the palate is intriguing with red, blue and black fruit flavors, appealing spice and minerals, framed by delicate, ripe tannins. The wine’s structure builds gradually through the mid-palate and speaks to its intensity, balance and potential for longevity.” For us, collectively, it just wasn’t happening. We’ve had Pinot Noir wines that cost a lot less that tasted and satisfied way more than this wine. Maybe it was a bad bottle. Maybe it wasn’t a good vintage. Regardless, our opinion tells us to stay away from it. At the end of the day, all any of us want to do is see our kids do well; sit back and relax after a long day, and enjoy a good bottle of wine. Well, today, we got two out of three–which ain’t bad (as the song went). . .we hope that you enjoyed your favorite wine today and did so responsibly, and remember to recycle whenever possible. Day 175: Katie – Barr The Door . . .
Ahh, Friday. The last bastion of work before relaxation! A time to kick back and let go of the work week worries (just try saying that fast three times!) Not sure if you’ve been paying attention, but a week from today is March 1st! Yeah, funny how it sneaks up on you . . . January – well, with 31 days, it’s already a known quantity – especially after December which also has 31 days, so February is kind of kickback for two consecutive 31 day months — it’s like a tax refund — of days, but the only problem is that we get seriously short-changed. Come on, – 28 days? It’s like the month just starts and then it’s over. And, to make matters worse, we HAVE to go into March . . . kicking and screaming because we just got used to February and SOMEONE pulled the plug on it! Surviving February is much easier this year . . . it’s been in the high 60’s and mid-70’s pretty much all month. While the midwest and northeast have enjoyed a, ahem, substantial winter – our part of the world has seen above average temperatures and below average precipitation. Lot’s of snow fell yesterday in and around our old stomping grounds in St. Louis, and the same storm is heading towards the New England area where daughter #2 is’ battening down the hatches’ (so to speak) and ready for a third consecutive weekend of winter weather. Uhhh, yeah, we’ll just sit here and enjoy some wine ON THE DECK because we CAN, and know that at some point between February, March or April, we’ll probably get OUR just rewards . . . so much for being smug about it! Since it’s a Friday–the last Friday in February 2013–we decided to make a trip back to Paso Robles, and more specifically, to the family vineyards we stayed at during our trip there. The good folks at Barr Estate treated us to beautiful surroundings, the opportunity to lend a small hand to their operation and, most importantly, the pleasure of trying their wines. Now, we’ve previously written about and raved about their Malbec, so tonight we broke open our bottle of their 2007 Reserve Cabernet Sauvignon. This is no ordinary Cab. It’s been aged in oak barrels for three – count ’em three–years! The minute we opened the bottle, we could tell that this was going to be a big wine. Crush encircled the cork and bottle rim; the aroma was permeating the kitchen . . . we had a feeling that this was going to be a tasty wine–just by the smell! Lots of tobacco, cedar, raspberries and blackberries on the nose–a veritable cornucopia of scents that combined with the subtleties of the oak barrels. It was a magnificent nose–leading, of course, to our first taste–and OMG! this was a big wine. It was like a meal in a wine glass!! (Well, not really, but it sounds so impressive!) We enjoyed this wine with a beautiful homemade pizza loaded with garlic, italian seasoning, red onions, red peppers, mushrooms, black olives, lots of cheese, sliced roma tomatoes and fresh basil. Yeah, it was a big meal to go with a big wine and we really liked both of them. As the evening progressed and wine opened up, it was amazing–almost like a dessert wine. The structure, the flavors, the tannins . . . these folks hit a ‘grand slam’ with this wine and ‘Katie Barr The Door’ we’ve got to get some more!! We loved their description, “Rich, intense, chocolaty aromas are layered with nuances of stewed black currants, tobacco and leather in this classic Cabernet.” NO? Really? We NEVER would have guessed that! Priced a little higher than our normal price range . . . at less than $30 a bottle, you’re probably going to want to get ahold of this gem – if it’s still available – because they don’t miss on their wines, and after seeing the time and effort put into the harvesting, we’re sold! We hope your weekend is relaxing and gives you the opportunity to enjoy your favorite wine(s). Regardless, please remember to enjoy them responsibly and recycle whenever possible. 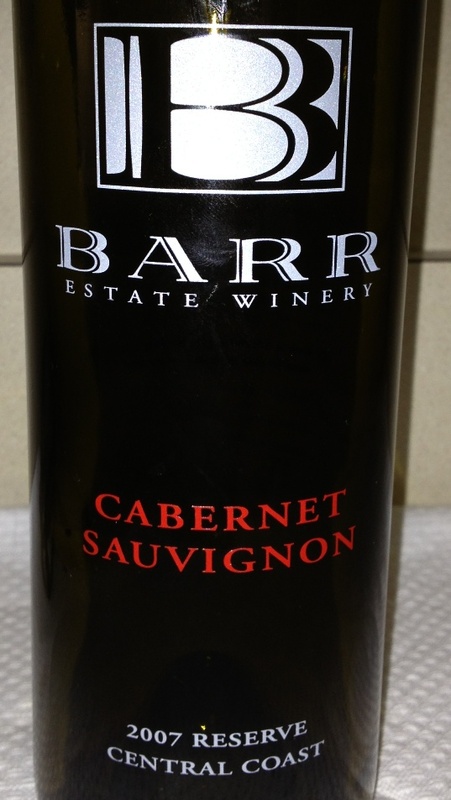 Categories: Uncategorized | Tags: Barr Estate Winery, CA, Malbec, Paso Robles, red wine | Permalink.